Design professionals are increasingly attracted to the aesthetic of an innovative product category in the porcelain industry: Large, Thin Format Porcelain tiles (“LTFP”). These tiles are typically produced in a high-density extrusion production process, achieving field tile sizes up to five feet wide by ten feet long. Can you specify them with confidence, though? A brief history: 10 years ago, several manufacturers attempted to introduce large format porcelains in 3 millimeter thickness and dimensions of 3 feet wide by 9 feet long. Initially the color palette and design range was somewhat limited, focused primarily on monochromatic screens. While these products piqued the interest of the tile industry, some questions had to be answered. How do we handle, cut and install this material? What do we install these products with? Are they for walls only, or can they be floor rated as well? 1. 3mm-5.5 mm thickness, 3 feet wide by 9 feet long. 2. 5.5 mm and thicker, 5 feet wide by 10 feet long. 1. Thinner LFTPs have the advantage of being ultra-light weight and flexible enough to bend in certain applications. The disadvantages include limitations on floor application; imperfections in flexibility due to tile contouring to existing subflooring problems; and a requirement for full mortar coverage in order to achieve desired support. 2. The 5.5mm and thicker products are floor-rated and offer more options for floor use; are rigid enough to avoid contouring; and edges can be fabricated. While the slight weight increase is the only real disadvantage to the thicker products, these are still capable of being installed with a normal installation crew. Full mortar coverage is still essential but the tile is more structurally sound. The Tile Council of North America, the author of the Handbook for Ceramic, Glass and Stone Tile Installation, has been studying all methods of installation to formulate LFTP guidelines. The National Tile Contractors Association, in conjunction with the Ceramic Tile Education Foundation, has established testing under their ACT program to offer certification specifically in the LFTP arena. Many manufacturers also have training and certification programs specific to their products. Setting material manufacturers are producing mortar products specifically tailored to the needs of these larger thin materials. Look for the designation “LHT” (Large and Heavy Mortars) from your favorite supplier. Best Tile is pleased to be the exclusive distributor for the industry’s premier LFTP offering: Plane by Stonepeak Ceramics. Among the first factories to produce the extruded, high-density 5.5mm thickness LFTP products, Stonepeak is now the most experienced manufacturer in LFTP technology, screen development, installation and certification practices. Best Tile’s stocking profile for the Plane series includes 5 feet by 10 feet panels that offer magnificent designs and minimal grout joints. With a thickness of 6 millimeters, the Plane series is just 1 mm thinner than many floor tiles, providing excellent rigidity and strength. The through-body design also allows bullnose details to be incorporated into the tile itself, so no need for finished edges. Don’t forget these great products are also available in smaller sizes ranging from 1.25 feet by 2.5 feet up to 5 feet by 5 feet. 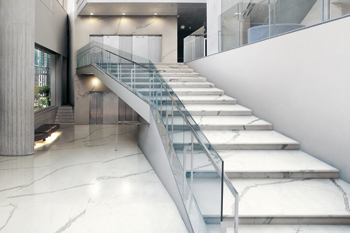 To confidently specify Large Format Thin Porcelain products, contact your local Best Tile commercial representative. They will help you find the right materials, installation mortars, surface preparation requirements, and will lead you through the “qualified labor specification” process using your TNCA handbook.